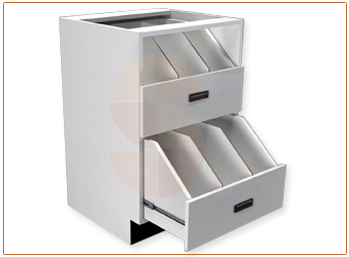 Pharmacy vial cabinets are built using 3/4" MDF in white color. All Rx cabinets measure 24" wide x 24" deep x 38" high, including a 5" high black toe kick. The vial unit has two large vial drawers with dividers. Drawers are open for easy access to large vials. Drawers have pull handle.